Wooden spoons at the ready – the kids are invading the kitchen! Before they strap themselves in to their aprons and start weighing and stirring, prepare yourself with our kitchen safety guide. Make yourself aware of the main hazards, and it will only be the eggs that get cracked! The kitchen is one of the most dangerous places in the home. Take three electric appliances, one very hot oven, two suspended pan handles and several sharp knives - you've got a recipe for potential disaster. But, just like every other part of life, your children will have to learn about these risks some time, and starting early will be worthwhile. You’ll also get some tasty baking as a bonus! Before you start cooking with the children, familiarise yourself with the recipe, get the ingredients ready, and decide which tasks to allocate to which children. Make sure that you pick a task your children can manage; too challenging and they’ll get fed up, too easy and they might get bored. 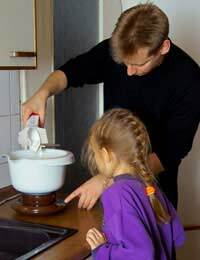 Very young children should start with the basic skills - squeezing lemons, buttering cake tins, and rubbing butter into flour – while as they get older, they can move on to jobs like grating, chopping vegetables and fruit, and whisking with a hand blender. As soon as your children start using the kitchen, start to teach them these basic safety rules. Hygiene: A stool at the sink and a squeezy bottle of antibacterial handwash make hand-washing a bit more fun. Make it part of your baking routine. If your children go outside while they’re waiting for the oven timer, pet the dog, or sneeze, remind them to wash again before touching food. It’s also a good idea to teach them some basic food hygiene, like using separate chopping boards for fruit and meat helps to isolate harmful germs. Knives: Make sure your children know how dangerous a knife is before you hand it to them. Explain what could happen if they fell while walking with a knife. When you decide to trust your children with knives, show them how to hold it with the blade facing outwards and downwards. Demonstrate how you would cut something – tucking in your fingers and keeping them well away from the blade. Electrical Appliances: Never touch anything electrical when you have wet hands – which is fairly frequently in the kitchen! It is a good idea to teach your children about using some of the electric appliances, which can be perfectly safe when used cautiously. Show them how to correctly put on lids and point out blades and other dangerous features so that your children are aware of the hazards. Working with Heat: It’s important to point out heat sources to your children. As well as oven temperatures, explain that steam can also burn skin, and hobs can remain hot even when they’ve been switched off. Explain the dangers of hot fat – the deep-fat fryer is one of the biggest causes of accidents in the UK, but shallow sautéing can also cause burns. When your children use an oven or take out a baking tray, they should always use thick oven gloves. There are lots of ingenious devices that can help to make your kitchen a safer place for children. You can buy drawer and cupboard catches – difficult for young children to open – as well as hob and fridge guards to protect toddlers from overhead dangers. Very young children should be kept out of the kitchen by means of a gate. Your children are learning – they’re bound to make some mistakes! Whether their mixture is too lumpy or the oven too hot, let them discover the cause-and-effect principles in baking for themselves. Keep them safe from the kitchen hazards, and hopefully a sunken cake will be the worst disaster they experience!